Max Messages per page indicates the maximum number of messages in a Webmail page. The user can set the number of messages in a page themselves, but this setting sets the maximum number that the user is allowed to set. The larger the number the user chooses the less paging needs to be performed by the user, but the slower loading will be. 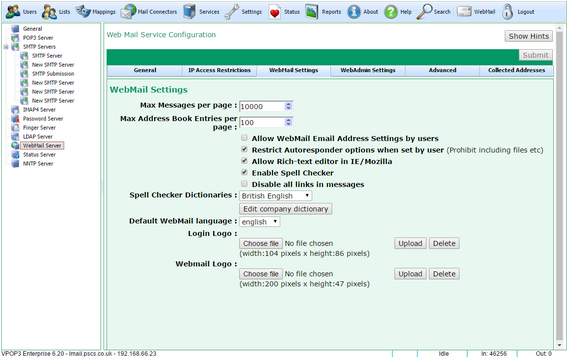 The Allow Webmail Email Address Settings by users option allows users to set their own email addresses in their Webmail settings. If this is disabled, then users' email addresses have to be set by the administrator. (This is used when the user has several email addresses they may send messages from. The Restrict Autoresponder options when set by user option restricts options that users can select for autoresponders, such as including files from disk etc. This should usually be turned on. 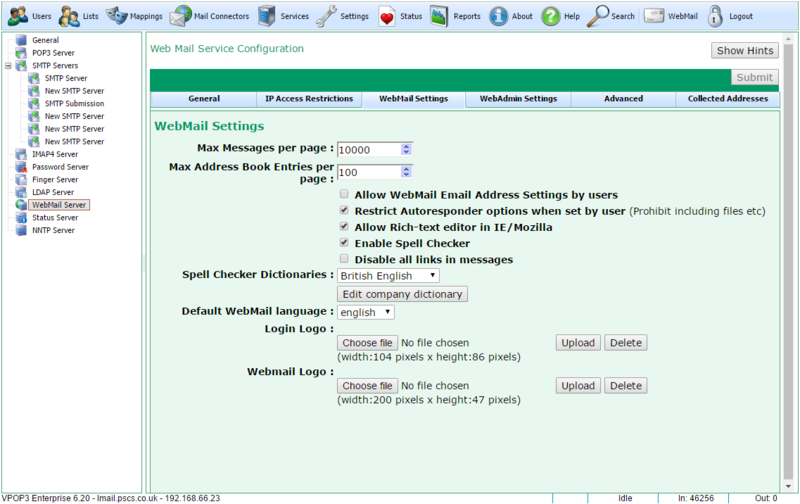 Allow Rich-text editor in IE/Mozilla enables a rich-text editor when composing a message in Webmail. This should usually be turned on. If it is off, then only a basic plain-text editor is supported. The Enable Spell Checker option enables a spell checker in the rich-text editor when composing a message. The Disable all links in messages option makes VPOP3 inactivate any links in messages. This means that users can't click on links to go to other sites. This may be seen as a security benefit, but can also be confusing and inconvenient for users. VPOP3 comes with several Spell Checker Dictionaries, you can select from them using the Spell Checker Dictionaries drop-down box. The Edit company dictionary button lets you specify a list of words to be added to a company-wide dictionary for the spell checker. Each user also has their own dictionary which they can maintain themselves. You can specify logos to add to the Webmail login page and to the top-right of the Webmail pages using the Login Logo and Webmail Logo options. The logo sizes are displayed for your reference. If you use other sizes then they will be rescaled which may make them look odd.